The Museum caption for the photo above: 462 Squadron, El Adem, Tobruk, 1944. Halifax Crew – Jock Hay, Tom Heeps, Peter Penny, King Cole, Billy Larkman (assumed to be named from left to right). This crew served with 462 Squadron in the Middle East, from early October 1943, until the end of February 1944. The RAAF Service Files for the 2 Australians in the crew, Nourse and Cole, have been digitised, so additional information is included in a later section. Heeps is noted in the 462 Squadron Operational Record Books as being RNZAF, but his Service Number was not recorded. The other crew members were not identified by Air Force, but were most likely RAF or RAFVR (any Canadians were noted as "C"). Reference sources – Australian WW2 Nominal Roll; The National Archives of Australia (RAAF Service Files, 462 Squadron Operational Record Book). ** Tom's Service Number was quoted in a letter he wrote to the RAAF in April 1982, and his letter was inserted in Rear Gunner Cole's Service File. The RAAF Service Files for both Nourse and Cole have been digitised, and have been compared to determine probable crew formation and postings. Service Files are not available for the other members of this crew. In the ORB, crew surnames varied in spelling, and also with initials e.g. for this crew, Larkman was also recorded as Larkham and Larman; and Hay had also been recorded as Ray; T N Heeps also had the initials J N, and T M, and J H. Service numbers were not quoted in the ORB (except for deaths, or for Officer postings, but also with some errors). Attempts to identify the crew members via the Air Force List, or London Gazette, were not successful. If you can assist with correct names and Service Numbers of crew members, or photos, please make contact. 14 May 1943 – Nourse posted to 15 Operational Training Unit (15 OTU), RAF Harwell, UK. 04 May 1943 – Cole posted to 15 OTU, RAF Harwell, UK. 10 July 1943 – Nourse posted to 1663 Conversion Unit (1663 CU), Rufforth, UK. 10 July 1943 – Cole posted to 1663 CU, Rufforth, UK. 9 October 1943 – Nourse posted to Mediterranean Air Command, posted to 462 Squadron with effect 14 October 1943. 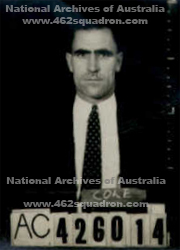 13 October 1943 – Cole posted to 462 Squadron, with effect 19 October 1943. 462 Squadron Operational Record Book, Form 540, October 1943 – Pilot Officer S J Nourse A.416782 was posted to 462 Squadron ex UK, with effect from 14 October 1943. His rank at that time was Flying Officer. Only Officers were recorded in Postings TO and FROM the squadron, so none of his crew were mentioned, as they were at the ranks of Flight Sergeant (Heeps and Cole) or Sergeant (Hay, Penny, Larkman). No Op has been located in which Nourse was 2nd Pilot. Nourse was correctly recorded as Flying Officer for his first Op at 462 Squadron on 25 October 1943, and for all of his subsequent Ops. The crew photo in the previous section was captioned as being at El Adem near Tobruk. The crew (and Squadron) were based at El Adem from 01 January 1944 to 01 March 1944. They were looking rather happy in the photo, perhaps in anticipation of leaving the desert and going to Italy. 01 March 1944 – 462 Squadron relocated to Italy, and re-named as 614 Squadron. 01 March 1944 – Nourse posted TO 614 Squadron (Italy). 01 March 1944 – Cole posted TO 614 Squadron (Italy). 23 June 1944 – Cole posted FROM 614 Squadron to 3 BPD, presumably having completed his Tour. 27 June 1944 – Nourse posted FROM 614 Squadron, having completing a further 17 Ops (total 33 Ops), and finishing his Tour. In a letter from the crew's former Observer Tom Heeps 42188 RNZAF, to the RAAF in April 1982, Tom mentions that Air Gunner "King" Cole and he served together in 462 Squadron in North Africa, and that halfway through their tour, the Squadron moved to Italy and was renamed 614 Squadron, a Target Marking Force based near Foggia. This appears to confirm that the crew remained together until they completed their Tour. and completed their Tours in June 1944. Pilot Stanley James NOURSE – details from his RAAF Service File A9300, National Archives of Australia. There are many abbreviations, conflicts in recorded dates on various documents, and some entries are almost illegible – my apologies for any transcription errors. 22 February 1941 – Enrolled in the RAAF Reserve, at No. 5 Recruiting Centre (5 RC) Adelaide, South Australia; allocated Reserve Badge No. 19812; age 26 years & 4 months; married; birth date 12 November 1914; born at Broken Hill, NSW; Anglican; no prior Military Service; civil occupation Cashier; no civil convictions; residing at 190 Mercury Street, Broken Hill; height 5 ft 8 inches; weight 157 lb. (71.2 kg); 6/6 vision both eyes, 20/20 hearing both ears; medium complexion, blue eyes, light brown hair, tattoos on both arms and left thigh. 11 September 1941 – Enlisted in the RAAF, at 5 RC, Adelaide SA; allocated RAAF service Number 416782; age 26 years & 10 months; other details as per his RAAF Reserve application; next of kin, wife, Melva Marjorie NOURSE, married 05 September 1940; also listed was his Mother Mrs C Nourse; Special qualification – "A" License, Broken Hill Club – Civil Aviation Board Pass 7.9.40 (assume this was a flying qualification); Educational qualifications – Intermediate Certificate completed, and Final Merc. Law Federal Inst. of Accts. (assume Mercantile Law and Accountancy studies?). Medical Category A1B. 11 September 1941 – Posted to 5 Initial Training School (5 ITS) Pearce, Western Australia; mustered as Air Crew V; classified as Air Craftman 2 (AC2). 05 November 1941 – Re-mustered as Aircrew V (P) at 5 ITS. 06 December 1941 – Re-mustered as Aircrew II (P), and promoted to Leading Air Craftman (LAC). 11 December 1941 – Posted to 9 Elementary Flying Training School (9 EFTS) Cunderdin, WA, training in Tiger Moth aircraft, 60 hours. 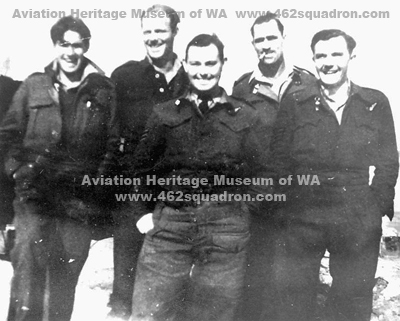 09 March 1942 – Posted to 4 Service Flying Training School (4 SFTS) Geraldton, WA; No. 20 Pilot Course, to 12 July 1942, training in Anson aircraft, 90 hours. 15 May 1942 – Received Flying Badge at 4 SFTS. 09 July 1942 – Granted a Commission, to the rank of Pilot Officer, at 4 SFTS (he must have had superior personal qualities and skills to be Commissioned from the rank of LAC). 10 July 1942 – Promoted to Pilot Officer. 11 July 1942 – Posted to 4 Embarkation Depot (4 ED), Adelaide, SA. 10 August 1942 – Posted to 1 ED, Melbourne, Vic. 24 August 1942 – Embarked from Sydney, Aus on the "Westernland" for the UK. 18 November 1942 – Disembarked in UK; Posted to 11 Personnel Despatch & Reception Centre (11 PDRC), Brighton, UK. 10 January 1943 – Promoted to Flying Officer. 02 March 1943 – Posted to 15 (Pilot) Advanced Flying Unit (15 (P) AFU), training in Oxford aircraft, 90 hours. 30 March 1943 – Attached to RAF Watchfield, Wiltshire. 14 May 1943 – Posted to 15 Operational Training Unit (15 OTU), RAF Harwell, UK (most likely formed a permanent crew at this OTU); training in Wellington aircraft, 80 hours. 10 July 1943 – Posted to 1663 Conversion Unit (1663 CU) Rufforth, for conversion to Halifax aircraft, 40 hours. 09 October 1943 – Posted to Mediterranean Air Command. 14 October 1943 – Posted to 462 Squadron, based at Terria to end December 1943, relocating with squadron to El Adem on 01 Jan 1944; Ops details in later section. 01 March 1944 – Posted to 614 Squadron, Foggia, Italy (to 17 June 1944). June 1944 – Received 1939/43 Star Ribbon (614 Squadron). 02 July 1944 – Posted to Middle East Command (MEC). 03 July 1944 – Posted to 203 Group, Heliopolis, Egypt (MEC). 10 July 1944 – Promoted to Flight Lieutenant. 13 July 1944 – Posted to 1675 Heavy Conversion Unit (1675 HCU), (MEC) non-operational flying (instructional) in Liberator aircraft, 325 hours (until 30 August 1945). 30 July 1944 – Posted to HQ RAF (MEC) as Instructor. 01 August 1944 – Posted to 3 Squadron, (MEC) Abu Sueir, Egypt, as Instructor. 27 November 1944 to 24 December 1944 – Trained as Flying Instructor in No. 12 Course, at No. 11 Flying Instructors School, at 1675 HCU; trained in the following aircraft – Oxford I, Anson I, Harvard IIA, day an night flights; studied Principles of Flight, Navigation & Meteorology, Airmanship, Technical Subjects, with passes of from 78 to 85 out of 100; Final result – 2nd in course 2nd with 81.5%; assessed as Average, for day and night flying, and as flying instructor. The Assessor remarked that Nourse "has developed an interest in the course and has worked hard", however he then wrote that Nourse "has a tendency to talk too much" but that this "should soon disappear as he gains experience as an instructor". 30 August 1945 – end of posting to 1675 Heavy Conversion Unit, non-operational flying (instructional). 01 September 1945 – Posted to 21 Personnel Transit Centre (21 PTC), Kasfareet (MEC) pending repatriation to Australia. 27 September 1945 – Embarked from Egypt for Australia from 21 PTC (MEC). 20 October 1945 – Disembarked at Melbourne; Taken on Strength at 1 PD. 30 November 1945 – Appointment terminated at 4 PD, on demobilization, at Rank of Flight Lieutenant. Other Special Courses – dates and locations not recorded in Service File. – Beam Approach Training (BAT) at "12 BAT", in Oxford aircraft, 20 hours (was this at RAF Watchfield?). – Target Marking at 462 and 614 Squadrons, in Halifax aircraft, 50 hours. Operational Flying 462 Squadron – Bombing, Halifax Aircraft, 16 Ops. Total Operational Flying from 19 October 1943 to 27 June 1944 – 195 Hours, 33 Ops. Service Conduct Sheet – for all listed postings "Certified No Entry". General Conduct Sheet – for all listed postings "Certified No Entry". Medals – 1939-45 Star, Italy Star, Defence Medal, War Medal 1939-45, Australian Service Medal 1939-45, Returned from Active Service Badge. Rear Gunner William John COLE – details taken from his RAAF Service File A9300, National Archives of Australia. Similar to Nourse's File, there are many abbreviations, conflicts in recorded dates on various documents, and some entries are almost illegible – my apologies for any transcription errors. 29 November 1941 – Enrolled in the RAAF Reserve, at No. 3 Recruiting Centre (3 RC) Brisbane, Qld; allocated Reserve Badge No. 12770; age 30 years & 8 months; single; birth date 04 March 1911; born at Corowa, NSW; Roman Catholic; no prior Military Service; civil occupation Carpenter; no civil convictions; residing at 401 Upper Edward St, Brisbane; height 5 ft 11 inches; weight 161 lb. (73 kg); Medical Classification A1B. 22 May 1942 – Enlisted in the RAAF, at 3 RC, Brisbane, Qld; allocated RAAF service Number 426014; age 31 years & 2 months; other details as per his RAAF Reserve application; with addition of physical description – Ruddy complexion, brown eyes, dark brown hair; Medical Classification A1,B3,A3,B (indistinct). His enlistment photo is shown in the preceding section. 22 May 1942 – Posted to 2 Initial Training School (2 ITS), Bradfield Park, Sydney, NSW; mustered as Air Crew V; classified as Air Craftman 2 (AC2); training in No. 28 Aircrew Course (G) – Passed. 21 or 23 July 1942 – Posted to 3 Wireless and Gunnery School (3 WAGS), Maryborough, Qld. No. 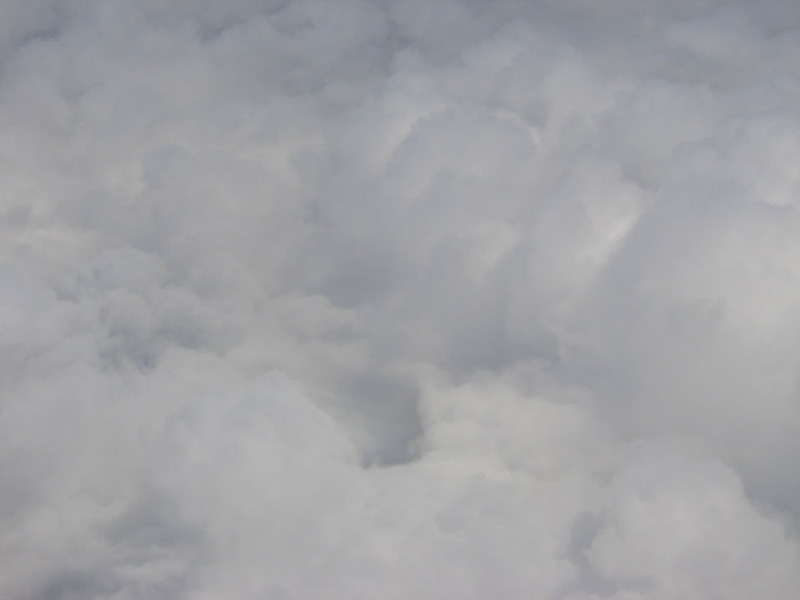 28 Air Gunner Course – Passed. 06 March 1943 – Embarked from Melbourne for the UK. 25 to 30 April 1943 – 6 days leave. 04 May 1943 – Posted to 15 OTU, RAF Harwell, UK (the permanent crew was most likely formed here with Pilot Nourse and other crew members) training in Wellington aircraft. 23/24 July 1943 – 48 hours leave pass. 04 August 1943 – Promoted to Flight Sergeant. 15 September 1943 to 07 October 1943 – Attached to RAF Lyneham, Wiltshire (location of transport links to Gibraltar, Malta, North Africa, India). 01 January 1944 – Relocated with 462 Squadron to El Adem, near Tobruk, arriving there on New Year's Day 1944. 25 March 1944 – Granted a Commission, to the rank of Pilot Officer, effective 26 March 1944, at 614 Squadron. July 1944 – Granted 1939-1943 Star Ribbon. 28 August or 03 September 1944 – Posted to 21 PTC (Personnel Transit Centre). 26 September 1944 – Promoted to Flying Officer. 11 December 1944 – Posted to 2 PD. 09 April 1945 – Posted to Aircrew School. 10 March 1947 – Appointment terminated on Demobilization. Ops for the Nourse Crew – 462 Squadron, from Forms 541, Operational Record Book. Op Number relates to Ops for Pilot Nourse. The usual crew was made up of those listed in previous sections, however for eight Ops, a substitute flew with the crew (on one occasion – 3), and their names are listed in the Comments. Aircraft were Halifax Mk II. The aircraft code was not usually recorded on the Form 541. All care has been taken in transcribing the data, however legibility of the original ORB was a problem, so errors may have occurred. Ops in October, November and December 1943 were flown from the base at Terria. Ops in January and February 1944 were flown from El Adem. one bomb hung-up, jettisoned in sea. 02/11/1943 3 W7845 2146 0335 Heraklion Aerodrome, Crete Cloud, bombed on probable target, landed at Benina before returning to base. 05/11/1943 4 W7845 1910 0305 Maritza Aerodrome Substitute Flight Engineer Sgt H Pearson. 11/11/1943 6 W7845 1836 0300 Maritza Aerodrome Observed JU88 in attack manoeuvre, but no contact. 16/11/1943 – BB425 not recorded not recorded Maritza Substitute W/OP F/Lt A Dunning; substitute Flight Engineer Sgt R J Taylor; substitute Bomb Aimer P/O P Ward; Op abandoned, starboard outer engine trouble, bombs jettisoned in sea; safe return. 18/11/1943 9 W7845 not recorded not recorded Candia, Crete Illuminator for attack on Candia, Crete. Substitute Rear Gunner F/Sgt R J Ellis; safe return, tyre burst on landing, no other damage. 05/12/1943 – W7845 1735 2040 Salonika, Greece Substitute Observer F/Sgt P G Evers; Op abandoned, starboard inner engine failure, feathered; bombs jettisoned in sea, returned on 3 engines. 08/12/1943 11 BB385 1754 0010 Candia, Crete Substitute Bomb Aimer F/Sgt G E Bunce. 09/01/1944 13 W7702 2304 0520 Salamis "Gardening" (i.e. Mines dropped). 26/01/1944 15 BB420 1746 0020 Piraeus Harbour Installations Illuminator aircraft with flares; port outer engine failure over base, landed on 3 engines. Nourse commenced 18 Ops, 2 of which were abandoned due to engine trouble. Those two would not have counted in his total Op tally of 16 (which corresponds with his Service File listing of 16 Ops at 462 Squadron). Similarly those two Ops would not have been counted in the various crew member's Ops. Observer Heeps – 17 Ops, 16 with Nourse, and one with Dalton crew (another Op with Nourse had been abandoned). W/OP Hay – 16 Ops, all with Nourse (another Op with Nourse had been abandoned). Rear Gunner Cole – 16 Ops, all with Nourse (another 2 Ops with Nourse had been abandoned). Flight Engineer Larkman – 15 Ops, all with Nourse (another Op with Nourse had been abandoned). Bomb Aimer Penny – 14 Ops, all with Nourse (another Op with Nourse had been abandoned).